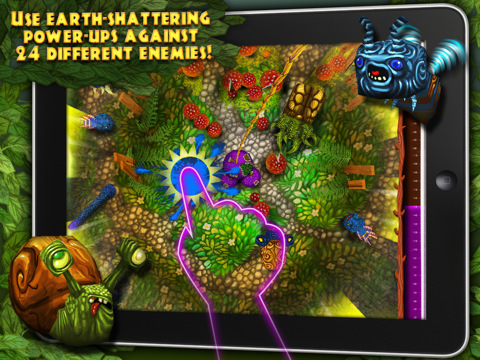 Prank Ltd develops the iPad app Ant Raid which is more of a strategy action game than anything else, and the object is to get your ants to defend their base. It is definitely not your usual RTS as there are no resources to be collected, nor can you spawn units. Once you have selected your ants and sent them off to fight, the only real management part comes in when you have to send more ants to revive those in need. More than anything, the trick of the game is managing this balance, so work fast. Killing off the enemy results in your ants being stunned or killed, and since there is no spawning you have to keep some ants to do “medic duties”. Different enemies present you with different challenges in this regard, keep an eye out for what each one does. There is also good news from enemy destruction, and that is that the different color enemies also give off energy for special abilities like extra speed or immortality. The controls are simple, yet the press and hold to select units is very efficient and works well and the smashing of enemies with your finger is very satisfying. There are 100 levels between the story and challenge modes, so if you like Ant Raid it will keep you busy for a good while, personally I found that it all started to feel the same after a while and it got boring for me. The graphics are really very good, and the HD cartoon like characters and surrounds are very entertaining. The motion of the units is good too, but comical is the goal here despite the really good rendering and detail. I must be honest, I can’t say that I got too involved with the story line, and it didnt have any real bearing on the action in the levels so I wasn’t too impressed there. The sounds are fine, and the quality is good and you can crank it up if you are in a destructive mood. The game also has a few levels that seem unreasonably difficult, and since you need to finish one to unlock the next, this may turn some players off. The game does offer Game Center support. Ant Raid is a good looking game, and the controls are clever too, but it’s varying levels of difficulty and it’s repetitive feel brings it down. It is however still fun, and a good start for Prank Ltd. although for what it is I think that at $2.99 it is overpriced. 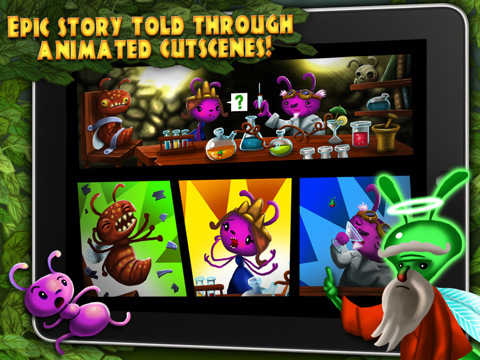 AppSafari review of Ant Raid was written by Richard Best on July 21st, 2011 and categorized under Action, App Store, Games, iPad apps, Strategy. Page viewed 4577 times, 1 so far today. Need help on using these apps? Please read the Help Page.